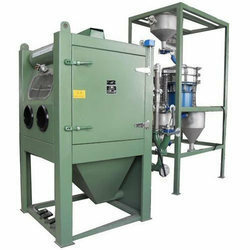 Manufacturer of a wide range of products which include sand blasting plant and sand blasting machine. We have with us rich industry experience in successfully handling the requirements of Sand Blasting Machine Services. After extensive research and development work, we have been able to come up with an upgraded range of Sand Blasting Plant for our esteemed customers. Machines offered in this range come in ready to use condition, and are provided with inside light for ensuring easy operations.